an end in 1962. The last of them were clearly identified by their double front brake drums. It's more difficult to say when the first Manx actually came into being. The overhead-cam Norton International launched in 1931 celebrated the marque's success during the 1931 season. It had swept the board at the principal international meetings, with 500cc twins in the Isle of ManTI, Dutch TT and the Belgian, French, German, Manx, Swedish and Swiss Grands Prix, plus five 350cc wins. Stanley Woods, Tim Hunt and Jimmie Simpson won four races each. No wonder they called the Norton "unapproachable!" The "Inter" could be ordered in road or race prepared versions, and inevitably, many of these "International to Racing Specification" models were intended for the amateur Manx GP. At Norton's works, such machines were called "Manx," though the name wasn't official until after WII, when it differentiated the production racers from the International sports model. The postwar Manx had a "Garden Gate" frame with plunger rear suspension and the new Roadholder telescopic fork. In 1949, the Manx gained twin overhead-camshafts, fitted to works bikes since 1937. 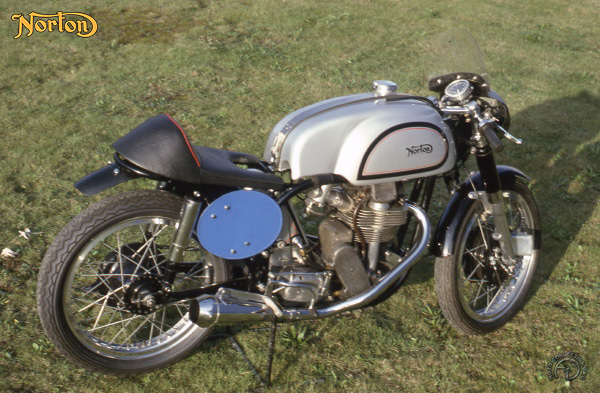 In 1950, Geoff Duke won at Blandford with the prototype 500 Featherbed Norton. The last real change in the Manx specification was a new camshaft drive in 1959. Production ceased in 1963. The Manx Norton was highly competitive: Derek Minter won the 1962 Race of the Year at Mallory Park on a Manx, beating a works Honda Four.